Description: NYS&W C-430 #3004, ex CR #2051, makes her debut in black and yellow at the Little Ferry roundhouse. Description: NYS&W C430 3004 pokes out of the roundhouse in Little Ferry after being painted. Description: OK, it's not Minnesota. I took this while out east for a wedding. Description: In the early years of their operation of the Northern Division, the NYSW ran frequent excurions. On these trips, they were not above doing some freight work en route. Here a trip approaches Utica behind a C430/RS3 power consist, with a couple of boxcars and a dead C 430 to set off west of the station. Description: C-430 #3004 sits in the yard at Binghamton, NY. Description: Laying over at the ex Erie enginehouse awaiting its next assignment. Description: Date approximate: Train ran up the Hudson secondary into Maybrook, then backed down via ex NH trackage to Campbell Hall. They ran around the east leg of the wye and up the old westbound main before continuing west for Binghamton. Description: SLN4 with an SD 45 sandwiched between a pair of C 430s passing the former yard at Port Jervis. The open area behind the train was once the westbound yard there, extending to Sparrow Bush. Description: With a cloud of smoke befitting its Alcos, NYSW SLN 4 has switched Nepera Chemical in Harriman, and is now rolling for Jersey at Newburg Jct, where the Erie main line turned west to Chester and Goshen. The NYSW train is on the Graham Line freight bypass built in 1907.. Description: Mostly. SLN 4 reaches the east end of Moodna, and will now work down toward Harriman and Jersey. Well get a surprise at Harriman, when the train stops to work Nepera Chemical there. Description: SLN 4 behind a pair of C 430s bracketing an SD 45 crosses the Lackawaxen River in its namesake town as it makes its way down the Erie Delaware Division toward Port Jervis and home rails at Passaic Jct. Description: SLN 4 rolls through the trees along the Delaware approaching Mill Rift bridge, as seen from the overlooks on NY 97 at Hawks Nest. It will shortly cross over into New York. Description: SLN 4 crosses Moodna Viaduct in a telephoto view. Even the long lens doesnt bring the train in much due to the massive dimensions of the viaduct. Description: SLN 4 crosses Moodna Viaduct, one of the great Erie steel bridges, in a wide angle view taken from near CR 20. Description: SLN 4 is working Nepera Chemical at Harriman, and will soon be on its way to Suffern and Little Ferry. Description: NYSW 3000 leads an eastbound Sea Land train at the Suffern passenger station on the former Erie. You can almost see the train rolling past behind an EL C425/SD45/C425 set. Description: Wrecked and scrapped about a year later. Description: NYSW 3004 sits at Binghamton yard waiting for the inevitable after suffering a rollover. Description: NYSW 3004, partly dismantled at Binghamton, in a view from the engineers side. It will be cut down to the frame in a few days. Description: NYSW 3004 had the misfortune of rolling over, which ended its career. 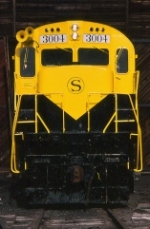 It wound up being scrapped at the NYSW yard in Binghamton. Description: NYSW 3004 has been cut down, and now there is nothing left but the frame and electrical cabinet. A few more days, and this C 430 will be only a memory. Description: The remains of cut up 3004 are still sitting in the yard, just the electrical cabinet left on the frame, which still sits on the Hi Ad trucks. The unit was cut up during February. Description: NYSW 3004, wrecked a couple of years earlier when it rolled over after hitting a snow clogged grade crossing, is all but gone. The frame has been mostly cut up now, and little remains of the superstructure.